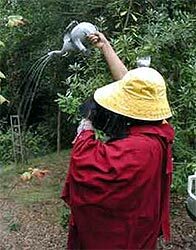 A full length Rinpoche Newssheet will follow after some time, in the meantime we hope you enjoy this briefer update on the inspiring and delightful activities of our immeasurably kind and amazing Spiritual Director. 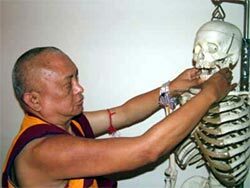 Rinpoche making a skeleton call out ‘Roger’! 2007 – dates coming soon! FPMT International Office staff try never miss out on the opportunity to have a quick meeting with the holy kind guru. Merry recently went to New York for the teachings of His Holiness and while walking to the taxi found just the right moment to have a very fruitful meeting with Rinpoche! While in New York City recently to attend His Holiness the Dalai Lama’s teachings, Rinpoche and Ven Roger needed a taxi. So they stood on opposite sides of the street to each try to hail a cab. 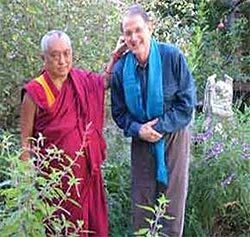 Ven Roger wasn’t having any success, and looked over to see that Rinpoche was successful in getting taxis – but Rinpoche was giving them to the other people waiting! I am the spiritual head of FPMT, which is a worldwide organization devoted to benefiting society through the practice and philosophy of Tibetan Buddhism, education, public service, health and culture. FPMT has 141 centers and activities in 31 countries. I am from Nepal, near Mount Everest. I heard about the very inspiring movie that you made, called An Inconvenient Truth. Myself and a number of monks and nuns (sangha) all from different counties, as well as other students went to see your movie. It is quite shocking to see the truth, what is happening in the world, where the world is going, particular the USA, its quite amazing. Based on money, just to produce more money. Even people are aware of the harm and the great danger and effect that will happen. Even now it has started happening, so many people living in this world are receiving the dangers through global warming, the danger of floods, melting snow, ice, flooding. That will soon endanger many people around the world and in USA. Myself and all the monks and nuns and students who went to see your movie highly appreciate your efforts and what you are doing to revealing the truth, exposing and introducing the truth to the world. With prayers for your long life, for your wishes to benefit others to succeed, and if you can specially help towards His Holiness the Dalai Lama and Tibetan people, to have total political and religious freedom, like before and to be guided by His Holiness the Dalai Lama. This is what the majority of Tibetans are anxiously, very earnestly wanting. I am the spiritual head of FPMT, which is a worldwide organization devoted to benefiting society through the practice and philosophy of Tibetan Buddhism, education, public service, health and culture. FPMT has 141 centers and activities in 31 countries. We have 21 Centers and projects in Australia, including Chenrezig Institute which is very close to the Australian Zoo. I am sending you my condolence for our dear Steve Irwin, who is known to the world as the crocodile hunter, maybe even known to the snakes and crocodiles, as well. I watched so many times Steve Irwin on TV for so many years, Steve catching snakes and crocodiles, letting them go and also helping them, and all his incredible excitement. It made me curious when I was watching him, being very active, how his life would end, whether one day he would be killed by one of those animals. When I heard the news I immediately did prayers, chanting many mantras, and prayers for him, purifying anything that causes suffering. I made prayers for the best thing to happen to him. You and your family must be very sad, but since you have a strong bond with him, then according to Buddhist philosophy, you have created the cause to meet him again, maybe not the same body, but different, but to meet again. He may not reincarnate in the same shape or body. Like the flame when you light another candle from it, the flame continues. Please continue your good heart, bringing peace to the world, to human beings and animals (that are the largest number in the world when you compare even to humans). Continue to give your love to them. This e-mail has been sent to the the FPMT General mailing list. Your email address has not been given to any Third Party. The FPMT controls all e-mail delivery to assure your privacy.